A good opening title sequence moves you to a different emotional place — Walter White’s desert meth lab or a purgatorial island or Don Draper’s 1960s Manhattan — usually in 10-60 seconds. Within 4 seconds, something’s wrong. 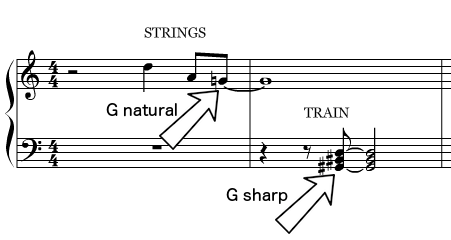 The key (or tonic, or home) is vague because we aren’t hearing full three-note chords, just two notes at a time in rising thirds. It’s like playing Wheel of Fortune — we only have some of the letters in each word, and we’re trying to figure out the meaning of the phrase. Back in DC, the clouds roll in, and the encroaching shadow takes the city from bright busy daylight down through dirty underpasses and into the pulsing heart of darkness. The heartbeat bass recasts the high-speed traffic as arterial blood. The heroic statues drown in darkness, in sync with the distant drums and trumpets — a bitter parody of patriotism. By the time that heartbeat bass fades out at the end, the milk of human kindness sits curdled in the cat’s dish, the cat is dead, and Frank Underwood is talking about two kinds of pain. That bass line stays the same from start to finish. It’s a technique called ground bass or basso ostinato — literally “stubborn bass” — a simple pattern in the bass that repeats over and over, creating a unified emotion, even as the rest of the music varies above it. The bass in the House of Cards theme is also telegraphing an emotion — and it’s pretty much Frank Underwood’s initials, if ya feel me. The key of A minor is drilled home in the most elemental way it can, 1 to 3, A-C-A-C. Composer Jeff Beal referred to that bass as “the stubbornness of Frank,” underpinning everything and refusing to change course. The rest of the harmony is also in A minor at first. It breaks into a barely perceptible A major at 0:48, then back to minor at 0:58 before ending in that kind of heroic, operatic A major starting at 1:18. But the “heroic, operatic A major” in House of Cards has a wee bit of poo stuck to it. Just as the Valkyrie comes in on that high A, and the strings are cranking away on the fast A major bugle call, that high violin falls through a descending melodic minor. And the wicked C in the bass is rubbing up against the happy C# in the strings. Bad touch, stranger danger! When I studied film scoring at UCLA, a few things were verboten. “Wallpapering” was one — that’s when the music never, ever shuts up. The composer feels the need to prime every emotional shift and even physical gestures. Very big in the 1930s-50s, not so much now. Another no-no was “mickeymousing,” the word for music that closely mimics visual details in the scene. Steamboat Willie (1928) was the first to do it — hence the name — and Looney Tunes amped it up to 11 — think of the xylophone mimicking the Coyote tiptoeing away from the pile of Acme dynamite. So G# and G-natural are both legal in A minor — the key of House of Cards. In this case, it uses those two clashing notes at the same time, producing a very cool dissonance that composer Jeff Beal inserts frequently in tense scenes throughout the series. Each time it’s an echo of that train, hurtling through the darkness. 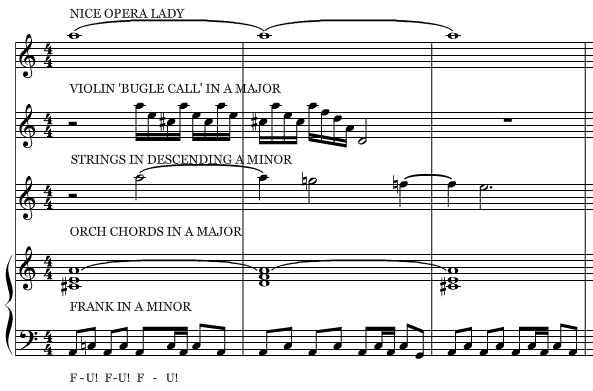 More on that chord and other brilliant cues from House of Cards in a later post.